Supports the Rooms module, a robust booking and room management solution, providing you all the functionality you’ll need to set up and run your business. Show-off your rooms, events, facilities and more using the fullscreen front page slideshow and great photography. Enjoy View blocks and pages based on Bootstrap Grid ready-made for your ease: Albums, Awards, Benefits, Events, Latest Posts, Promoted Posts, Popular Tags, Rooms, Services, Slideshow Full Width, Slideshow Boxed, Testimonials, Twitter Updates and yet much more. Making it easy for your visitor to locate your business on the map plays an ever-growing role nowadays, and Booking+ does great in this direction. Comes with a special content type for creating, showing off and grouping events. Comes with a built-in content type that allows you to create photo albums, to showcase your facilities and more. 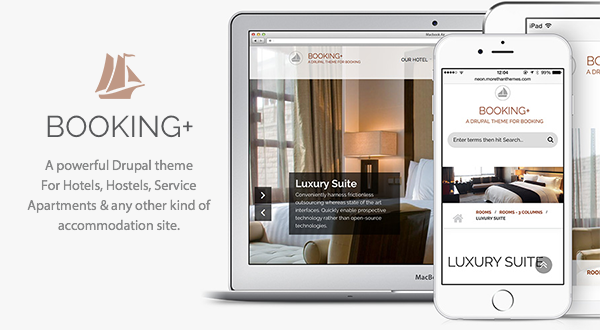 Booking+ comes with built-in and preconfigured ImageCache module. You just upload your photos and they are placed in the way they should be. Built using web standards and avoiding hacks or workarounds that might break it.